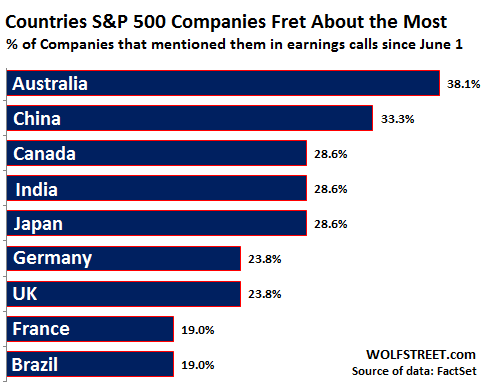 One way to gauge the level of concern about the situation in Greece is to see how many S&P 500 companies mentioned Greece relative to other countries during recent earnings conference calls so FactSet combed through the 21 earnings conference calls held since June 1 by S&P 500 companies and found these 9 countries to have been mentioned the most [where’s Greece?]. The above edited excerpt (and the copy below) is from an article* by Wolf Richter (wolfstreet.com/) originally entitled These 3 Countries Worry Corporate America the Most which can be read in its entirety HERE. 1. Oh Canada! Are You Prepared For What’s Likely Coming? 5. Canada’s Housing Market Most Overvalued In the World – and Could Burst At Any Time! In May, prices in Toronto rose another 5% from a year ago. For all types of homes, prices are now 42% higher than at the crazy peak of the prior bubble and, based on data from Canada Mortgage and Housing Corp., the number of completed but unsold condos in Toronto spiked in May to 2,837, an all-time record high. The magnitude of this spike far exceeds the monthly ups and downs in recent years, and exceeds even those dizzying spikes in the late 1980s and early 1990s when the Toronto condo market went completely haywire. Now all we need for this condo market to remain “well-behaved,” despite soaring starts and unsold inventories, is for a lot of buyers with a lot of money to emerge very quickly from China or wherever and “absorb” these units and all the units still coming on the market. Or else, this is going to turn into one epic condo glut.